The Finnsheep breed was developed in Finland over the past several centuries. The breed continues to evolve in its homeland to serve the needs of the Finnish people. DNA evidence shows that the breed developed from the crossing of native sheep with those that entered Northern Europe via trade routes established along the Atlantic coastline and the Danube and Volga River Systems. Designed to survive in the rugged climate of Finland, the Finnsheep is a hardy breed with exceptional foraging abilities. A two year old brown ewe and her four lambs graze on lush spring pastures. This ewe needed no assistance raising her lambs. Due to the long, dark winters, the Finnsheep evolved to have excellent reproductive capabilities designed to take advantage of the short summers. Finnsheep mature early, breed out of season and are known world-wide for their multiple birth abilities. A yearling Finn ewe averages 1.9 lambs/birth and mature ewes average 2.7 lambs/birth. Lifetime production is high due to the breed's natural longevity and fertility. The Finnsheep's ability to improve lamb percentages in commercial flocks is the major reason for the breed's exportation from Finland to over 40 countries. Even today, the breed continues to be in demand by commercial producers looking for a quiet-tempered breed to enhance production and provide a quality wool clip. Finnsheep adapt relatively well to different climates and they can be found in the Middle East, Africa, Australia, Eastern and Central Europe and North America in addition to Northern Europe. 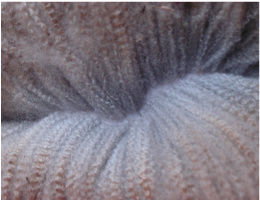 Finnsheep wool is very unique among Northern European short-tailed breeds. 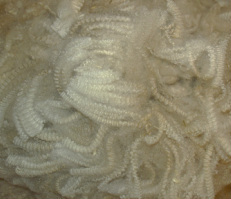 The wool is semi-lustrous, silky soft and possesses more crimps per inch than any other short-tailed breed. The increased crimps per inch add additional elasticity, ensuring a more durable and flexible product. Finnsheep wool is medium-fine to medium making it suitable for a wide variety of uses; its ability to felt well farther increases the marketabilty of products. Although a majority of Finnsheep are white, the breed comes in a wide variety of colors and patterns allowing for outstanding variation in the production of natural, organic or undyed products. This is a huge marketing factor in today's more environmentally aware marketplace. High luster Finn wool with well defined staples and crimp. While the Finnsheep breed is not one of the world's top dairy breeds, it can produce enough milk for a small family farm to make some designer cheese for the family table. Finnsheep genetics are found in cross-bred dairy flocks throughout the world and they were used in the development of the Rideau Arcott and the Outaouais Arcott, two milking breeds found primarily in North America. 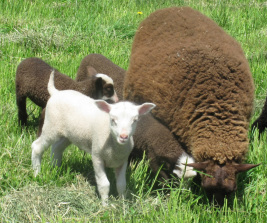 The Finnsheep breed has been used in the development of modern breeds and its genetics can be found in over 20 breeds world-wide. Sheep are one of the most versatile production animals, capable of producing a wider variety of marketable products than any other farm animal. Lean, tender and juicy meats as well as gourmet cheese are just two of the value added products that can be produced. In addition to lean meats, Finnsheep provide a wide variety of products for a variety of markets. With their naturally short tails, lack of horns and quiet temperaments, they offer a unique opportunity for today's self-sufficient homestead. They fit well into a local, slow foods business and offer the potential to improve production capabilities in the large, commercial flock. The quality and variety of Finn wool products are constantly sourced by today's artistic textile professionals. With the IFR's Breed Improvement Program, which allows for the addition of scrapie-resistant genetics, today's Finnsheep are more disease resistant than ever. If you are looking for a high-performing, versatile sheep to add to your farm, the Finnsheep should be a top contender.